Hide deals from seller "W. Kim Taekwondo "
Limit 1 per person. Valid on 1 month of beginner group tae kwon do and hapkido lessons for children ages 4 and up. Includes 2 classes per week for 4 weeks. Beginners only. New students only. Promotional value expires 60 days after purchase. 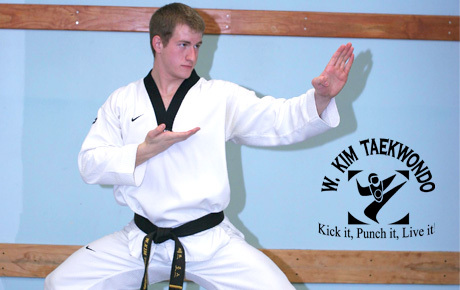 Strengthen your mind, body and spirit with 50% off one month of beginner tae kwon do and hapkido lessons at W. Kim Taekwondo & Hapkido in Palatine ($165 value). A total of eight 45-minute classes will place your child on a path toward martial arts mastery. Grand Master Kim has a passion for tae kwon do, and for more than 30 years he has shared his knowledge with students. The instructors at W. Kim Taekwondo & Hapkido emphasize personal development through martial arts, and they provide a positive environment for students to learn and grow. Parents will recognize increased confidence and self-esteem in addition to improved fitness and a sharper mental focus. Work toward a better you with this deal. A martial arts studio in Palatine teaching tae kwon do and hapkido.